Last week the New York Giants were defending their home turf at the new billion-dollar New Meadowlands Stadium against the division rival Philadelphia Eagles, but despite having the game seemingly in hand and heading into overtime, the Giants suffered the most disappointing loss of the season as the lightning quick DeSean Jackson returned a punt for a touchdown with time expiring in the fourth quarter. Even though the Eagles were able to get the best of their division rivals last week, it would be hard to argue that the Giants didn’t give Michael Vick and company a run for their money as a result could easily have gone in New York’s way. Fortunately, despite the Philadelphia Eagles being in position to win the NFC East division title, the New York Giants still have a shot of heading into the playoffs if they can get the best of Aaron Rodgers and the Green Bay Packers in Week 16. So all they have to do in Week 16 is come out with a win, but they will have their work cut out for them as the Packers are in desperation mode right now as well and will be defending Lambeau Field with everything they have this weekend. Coming into his NFL regular season, the Green Bay Packers were considered to be legitimate Super Bowl title contenders as they had all the right pieces to the puzzle finally coming together with a potent offense backed up by a lockdown defense. 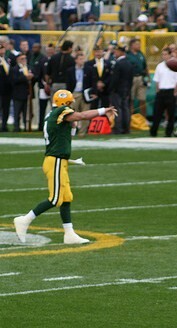 Unfortunately, the Packers were bitten by the injury bug early and often this season as they lost running back Ryan Grant and tight end Jermichael Finley to season-ending injuries early in the year. Without Grant come out of the backfield, the Packers running game was virtually nonexistent as their only real threat on the ground was when quarterback Aaron Rodgers scrambled. Along with having no running game, Rogers had to deal with losing arguably his favorite target in Finley. There is no question that there are plenty of great offense of weapons at his disposal, but without Finley red zone situations have become more difficult for the perennial Pro Bowl quarterback. Despite all their injuries and all their problems throughout the season, the Green Bay Packers are still in contention for a playoff spot as they will need to win their next two games in order to wrap up an NFC Wildcard spot. Even though I believe the Green Bay Packers are more than capable of winning the next two games and making it back into the playoffs, they will definitely have their work cut out for them as they will have to get the best of the New York Giants this week and the division rival Chicago Bears. As of right now, the Packers have been given the edge in this matchup with a -3 point spread in their favor. This game will without a doubt be hard fought battle from start to finish as needed team will want to lose his game and possibly be on the outside looking in on the playoffs, but in the end I see Green Bay winning this game and keeping their playoff hopes alive.